The ACA500plus is the successor to the popular ACA500. We've taken all our customer's suggestions, added more hardware and software, and turned an already-successful product into an Amiga user's dream. The existing concept of the ACA500 remains: It is your one-stop-shop tool for a quick and easy re-entry into the "hobby Amiga". We've looked at all the potential problems you might have when unboxing your A500 or A500+ after more than 20 years, and bundled all solutions into a single product that works on all A500 and A500+ revisions. The ACA500plus features an MC68EC000 processor, 8MBytes RAM, 8MBytes Flash, two CF card slots, an Action Replay-compatible freezer and a stylish 7-segment display called "DisMo". Several expansion ports let you add even more functionality. If you already have a memory expansion inside your A500, you can continue to use that in most cases. The MC68EC000-10 processor is clocked at 14MHz as standard. This guaranteed frequency will give your computer more than a double-speed boost. If that's not enough, you can choose overclocking to 21, 28 or even 42MHz. By attaching an ACA12xx or Blizzard 12xx accelerator, you make your A500 faster than a stock A3000. The ACA500plus comes with essential software pre-installed in it's large flash. This includes fully licensed Kickstart versions V1.2 and V1.3 for backwards-compatibility, and Kickstart V3.1 for running the final version of the OS that Commodore has published. You've lost your installation disks of the OS? Not a problem with the ACA500plus. A full installer for OS3.1 is included in the product. All you need is an empty CF card, and you can install OS3.1 with a few key presses. After that's done, you can use the second CF card slot to exchange data with a modern PC: The ACA500plus supports PC-formatted cards and long filenames out of the box, no special installation required. CF cards are handled like harddisks on the Amiga-side. You can use HDtoolbox or HDinsttools - whatever you prefer. Even the two popular 64-bit addressing modes are implemented: Both TD64 and NSD64 command sets are supported, so whatever your preferred filesystem requires, you can use it on your ACA500plus setup to access flash cards that are larger than 4GBytes. Speed-wise, the CF card slots are faster than most harddisk controllers that are available for other Amiga computers. 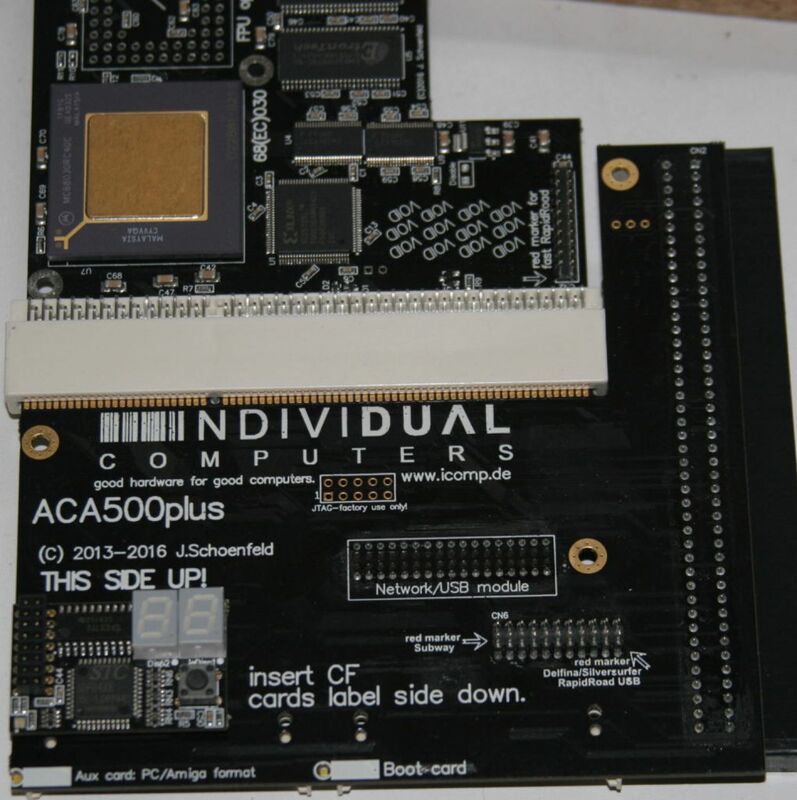 The ACA500plus even outperforms the SCSI controller of an A3000! ACA500plus is an external expansion which is plugged to the left expansion port of your A500 or A500+. There is no need to open the computer at any time. This includes a new revolutionary method that can turn your 512k trapdoor memory expansion into chipram! If your Amiga is equipped with an ECS Agnus chip and said internal 512k memory expansion, you can turn your computer into a 1MByte-Chipram computer, just by selecting a menu item in the configuration menu of the ACA500plus! A lot of stock A500 computers with board revision 6 or higher have this exact configuration. Many users will want to use the ACA500plus with the popular WHDload software, which lets you install games on CF cards instead of swapping floppy disks if you want to play a different game. WHDload lists the 68010 processor as a minimum requirement for using the Quit-key and return to the Amiga's Workbench. The ACA500plus has special circuitry that lets you use the WHDload quit-key at any time, although you "only" have a 68EC000 processor. This is supported by WHDload V17.2 and higher. Advanced floppy control: If your computer has a defective or even a missing floppy drive, the ACA500plus can handle this. With the built-in "bootselector" circuitry, you can turn an external drive into a fully-compatible df0: drive. In addition to that, the floppy control functions allow you to make external drives invisible, although they do not have an off-switch. This saves you the work of (un)plugging drives in order to make older floppy-based software compatible. The A1200-compatible clockport can be used for expansions that were initially designed for the clockport of the A1200, for example Catweasel MK2, Delfina or RapidRoad. Please note that some drivers may require patching in order to work on a non-A1200 computer. Contact the vendor of your A1200 expansion to find out if they provide such a driver. The 16-bit local expansion port is reserved for our forthcoming network/USB expansion. The A1200 CPU card connector is meant for further CPU and RAM upgrades. It is guaranteed to work with our ACA1220, ACA1221(ec), ACA1232 and ACA1233(n) models. Our older ACA1230 accelerators are not supported. We will therefore only answer support questions about ACA1220, ACA1221(ec), ACA1232 and ACA1233(n) accelerators. The same applies to old Blizzard accelerators by Phase 5: We've done our best to make them work, but there are limits to what we can do. Please keep in mind that the A500 is a 16-bit architecture, and the Blizzard accelerators have been developed for the 32-bit architecture of the A1200. Another new feature of the ACA500plus is it's capability to make use of the clock port(s) that an A1200 accelerator provides, even if the clock port of the ACA500plus is already occupied. A maxed-out configuration can use up to three clock port devices. Further, the ACA500plus gives you all possibilities to connect and use a realtime clock: Either on the trapdoor expansion of your A500, directly on the clock port of the ACA500plus or on the A1200 accelerator. This kind of flexibility was not available on the predecessor ACA500. With all these expansions, certain software may be incompatible. However, this is not a reason to unplug the ACA500plus, as it features an advanced cloaking mode that lets you downgrade the computer to standard memory configurations with minimal expansions (like Action Replay) or even no expansions at all, your choice of Kickstart ROM, running at the original 7MHz speed. Even if your computer does not have an internal 512k trapdoor memory expansion, the ACA500plus can not only add this, but even emulate the cycle-exact speed of the internal expansion with the same slow-down effects that an internal memory expansion has. In other words: There is no reason to unplug the ACA500plus at any time.